History & Soft Elegance “England has History, but America has Geography” suggests English artist Neil Gaiman, in an interview on his multi-award novel ‘American Gods’ . I personally believe also that Geography influences History. Like thousands of years ago, when an exceptional first ‘global net’ was possible by the specific geography of Mediterranean Sea, that permitted to populations around it to avoid lands distance by sailing, and expanding in this way Culture and Technology. Among many, two words just came etymologically from that world: Geography (‘γῆ’, ‘earth’, ‘γραφία’, ‘writing’:’description of the Earth‘), and Photography, (‘φῶς’, ‘light’ and ‘γραφή’, ‘drawing’: ‘drawing with light’). Both of them from ancient Greek, they have been destined to cross often each other, as in the perfect example of the National Geographic: the magazine has always been strictly tied to progress of Photography, as with Color already in its pages from 1910, before the first Eastman Kodak color film ‘Kodachrome’ in 30ies. But also before the 70ies Color recognition in the Art world of some Western photographers like William Eggleston in first, and, over the Atlantic, of another pioneer from a small European town..
“..Perhaps it was that soft elegance [of Kodak’s Kodachrome film] that inspired the legendary Italian photographer Luigi Ghirri’s unique style when he first began taking pictures of his surroundings in the early 1970s..” writes Hanne Christiansen , about reissued first Ghirri’s book ‘Kodachrome‘ (originally of 1978) by MACK Books editions of London, in 2012. 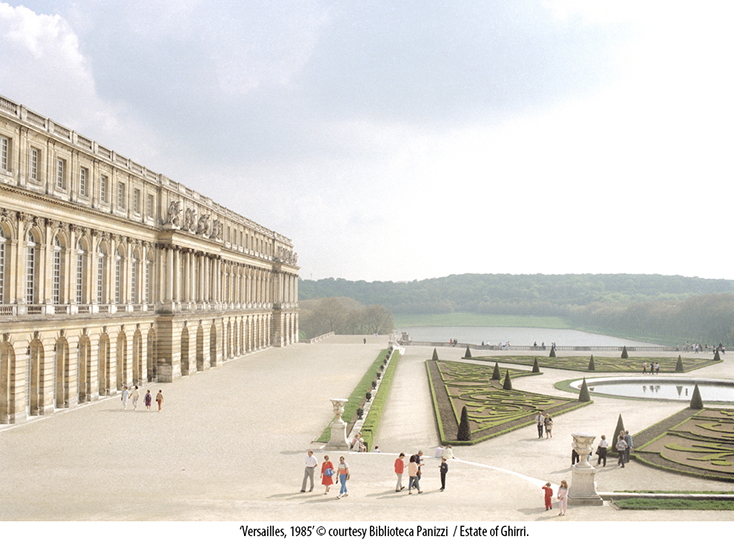 Luigi Ghirri (born in Scandiano, Italy, 1943 – Reggio Emilia, Italy, 1992) is one of the most influential European photographers of ‘900. A concrete curiosity for the world around us and an interest for the conceptual side of act of ‘Looking’, move his elegant, suspended urban visions and modern landscapes. 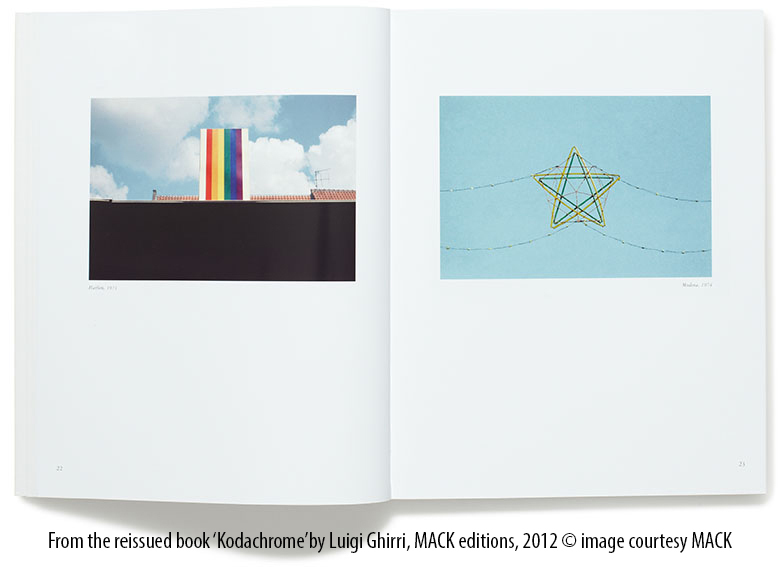 During last years, the inclusion of Kodakchrome in 2004 by Martin Parr in ‘The Photobook: A History, Vol. 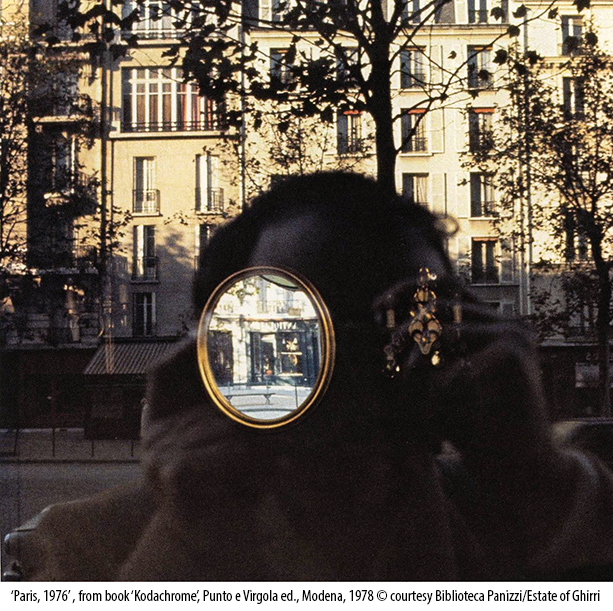 1′, Phaidon ed., started a renovate world interest, with his first English monograph out in 2008 (‘It’s Beautiful Here, Isn’t It..‘, Aperture Foundation ed. 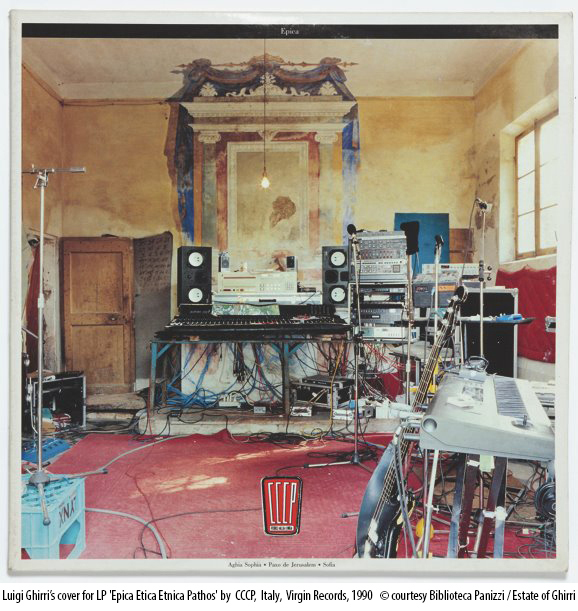 ), and the book ‘Casa Ghirri’ by Francois Halard (Keherer Verlag ed., 2013), portraying his studio in Ronconcesi village. Various museums held his works (i.e. Stedelijk Museum, Amsterdam; Museo della Fotografia Contemporanea, Milan; Bibliotèque Nationale, Paris; MOMA in New York), and this July has two shows of Ghirri in USA and Europe: at Matthew Marks Gallery in Los Angeles, (just closed the July 12th, following their previous April 2013 show in New York), and in Reggio Emilia, Italy, until July 27, with a majestic retrospective “Luigi Ghirri ‘Pensare per Immagini’ Icone Paesaggi Architetture“ (“Luigi Ghirri ‘Thinking Images’ Icons, Landscapes, Architectures“, curated by Francesca Fabiani, Laura Gasparini, Giuliano Sergio), presenting over 300 original and new printed images and much more, previously in 2013 first at MAXXI museum in Rome, then moved in Brazil. “Open up yer eyes an’ ears an’ yer influenced. An’ there’s nothing you can do about it”, Ghirri used to say, quoting Bob Dylan , and also: “Not at photography school, studio, or photojournalist agency, instead my experience born by generally looking for the Image around me, and by an endless passion, a bit naive, just straight pulsing for the Art world” . 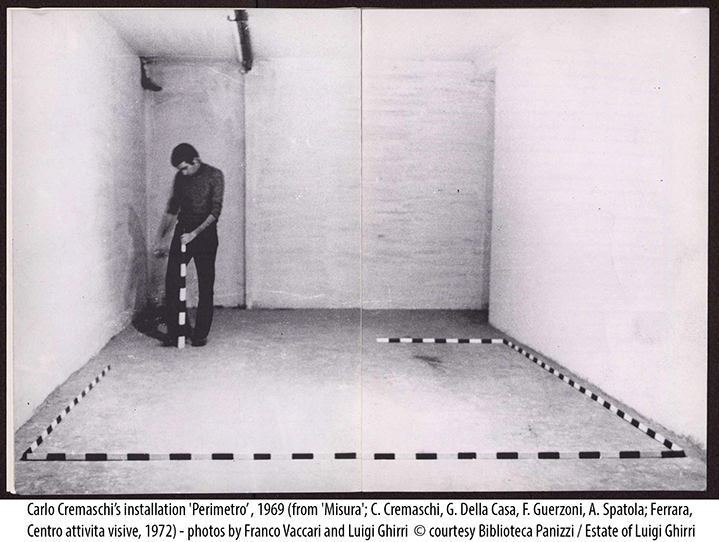 At the end of 60ies after Technical Institute, Luigi Ghirri does not attend University starting to work as surveyor in Modena town, and regularly meeting Conceptualist artists of the area, whose he photographs the performance, installations, but also adding images in their works. 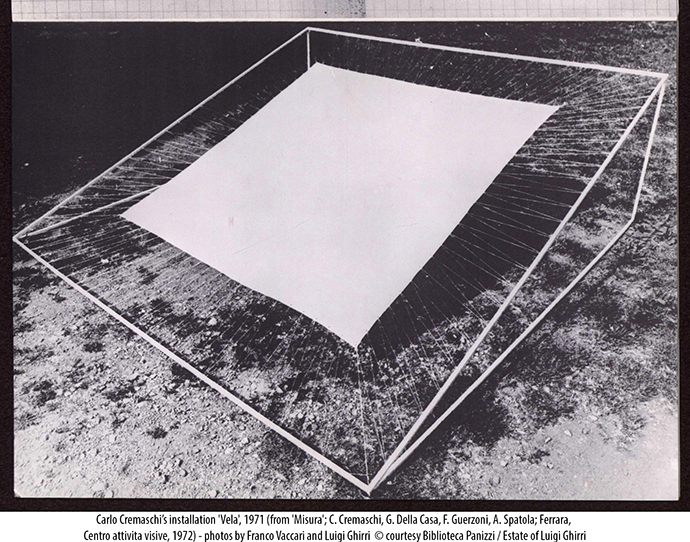 While Pop-Art was exploding in USA, Conceptualism movement in Italy was developing an extreme ‘de-construction’ of Photography medium and a new role for it, felt as quick, mechanical, authorial but not ‘orthodox’ Art. Important exhibitions are then visited by Ghirri in Parma and Modena towns: the photographic metalinguistic research of Italian Ugo Mulas in Verifiche (1970-1972), the New Photography Usa show (1971), Dorothea Lange (1972), and especially, the one of Farm Security Administration (1975). 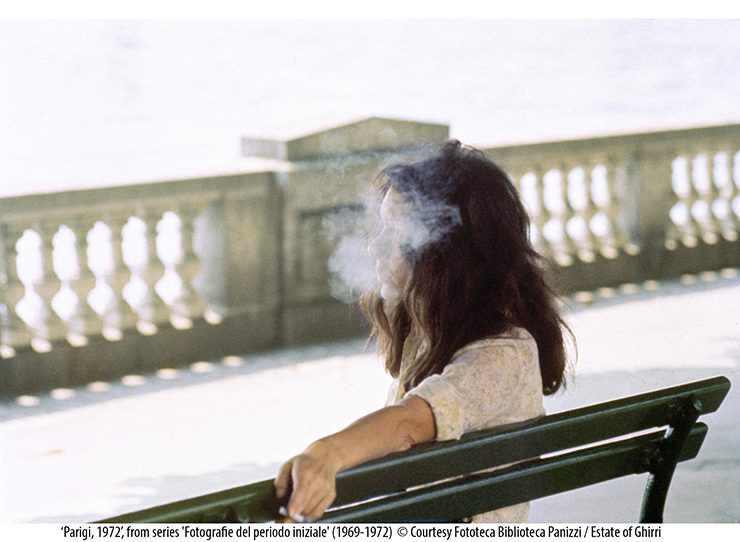 Holiday travels at end of 60s and first 70s by Luigi Ghirri and family in France, Netherland, Switzerland and Northern Italy, become then the first source of a large body of images for his present and future researches. Switching from 35mm films to a medium format, Ghirri starts not photographing specific themes but glimpses of life and of places visited, as a minimal urban diary. A bit as Lee Friedlander, yet in color and with a certain ‘style’: a kind of wonder, simplicity, first-time view, recalling to myself, the Italian poet Giovanni Pascoli (1855-1912) and his ‘Poetica del Fanciullino’ (‘Poetic of the little Child’), where he theorized to look at the everyday world as children do, with no specific knowledge, just discovering it deeply by first feelings. More systematically, Ghirri then begins to organize photographic researches focusing on the contemporary environment and its identity’s transformations. 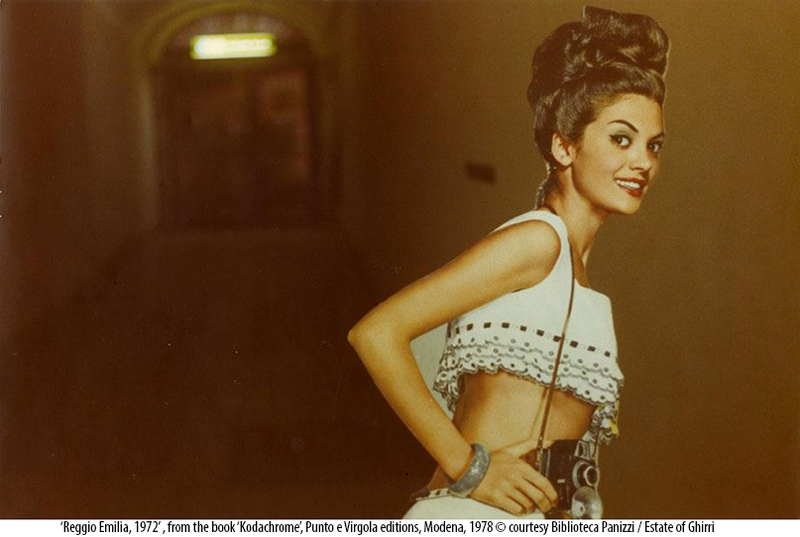 His first exhibition organized by a local photo-association in the hotel hall ‘Canalgrande’ of Modena (1972) permits him to meet Art critic of Parma University, Massimo Mussino, casually stopped there. Two years later Ghirri is invited to exhibit at ‘Il Diaframma’ gallery in Milan, successful show connecting him to larger public of artists and critics. 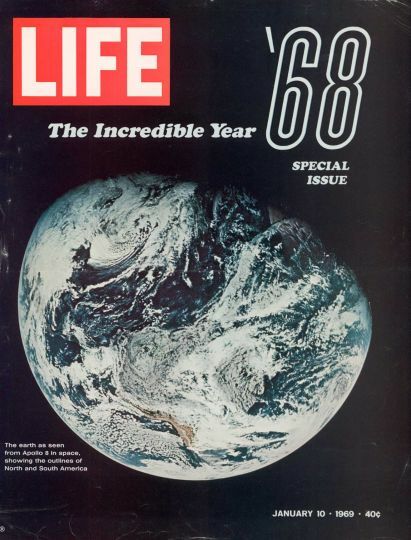 World seen by Space “In 1969 the newspapers published the photograph taken from the spaceship traveling to the moon. This was the first photograph of the entire Earth.. -Ghirri writes in the introduction of Kodachrome– ..The image that man had pursued for centuries was presented for our view; [..] the only image that contained all other images of the world: graffiti, frescoes, paintings, writings, photographs, books, films. 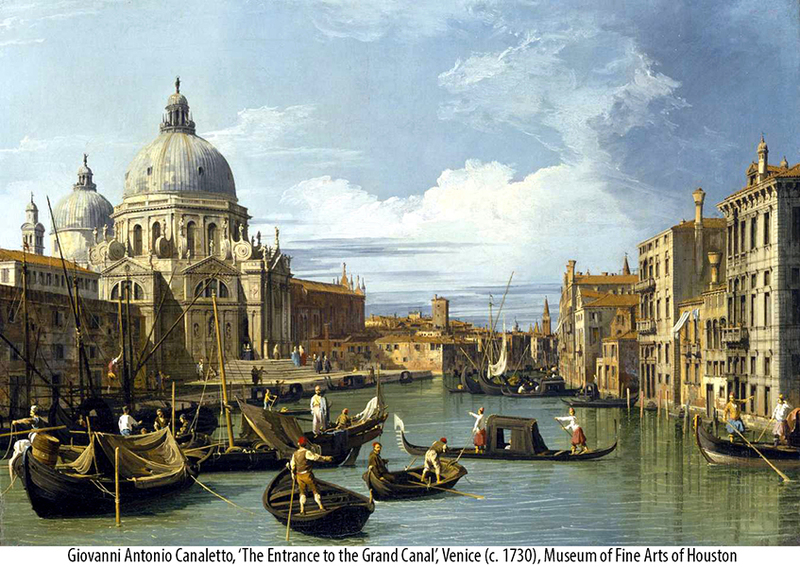 It was at once the representation of the world and all representations of the world”. This photo is for Ghirri the ‘starting point’ of his Photography , and it marks a cultural change too: after centuries of Geography drawings, now it is time for chemical Photography to show us the same and a New Geography of the Earth and over. Intended as a ‘collection’ of the personal works and first commissions of the fertile period of 1970-1978, Kodachrome is self-produced, with low budget and the title is an homage to the film that has democratized Photography for mass public. Throughout 92 photographs Ghirri shows the world he sees around himself: surrealistic, vivid, traduced in images sometimes exaggerated, sometimes reduced to basic geometrical shapes, as in ‘Riva di Tures, 1977’. Results are not just ‘photomontages’: in the current advertising society “extensively reality is transformed into a colossal photograph and the montage has already taken place at that very moment” explains Ghirri always in Kodachrome. Omnipresent but often ignored, urban hieroglyphs emerge alive from the stratified complexity of human/artificial/natural things around us, by what Ghiiri calls ‘fotosmontaggio’, the process of de-assembling the space by images. Photography gets back to be elementary exploration / decodification of the space. And he seems disappeared behind camera, refreshing the ‘Looking’: there is no self-analysis, Cartier-Bresson’s ‘decisive moment’ or self-centered point of view, but a certain distance, and absence of ethic or historical judgement, trying instead to unveil the reality by a ‘pure’ view. 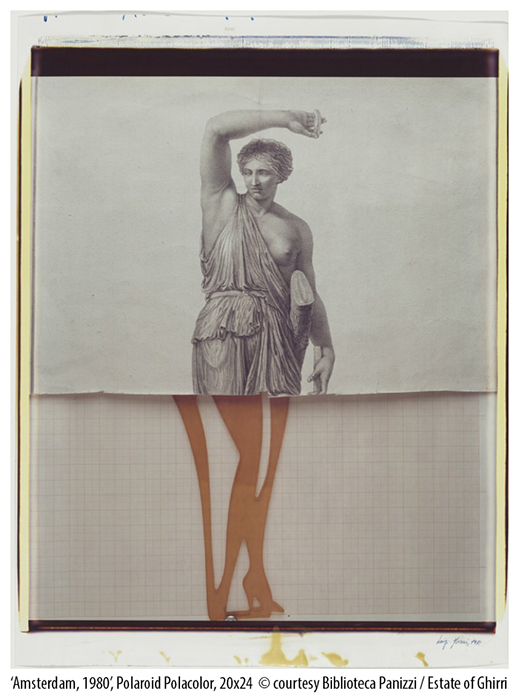 Photograph with an advertising cardboard shape girl (Reggio Emilia, 1972) is a juxtaposition of different visual elements, but maybe also it is a new ‘scene’ that Ghirri’s unconscious-eye saw suddenly on the way: ‘platonic idea’ of a seductive, 60ies look girl strangely appearing and smiling at him in open air, captured by his camera. Over the document, a photo can be a projection/record of what someone deeply perceives/sees from outside, instead of what is ‘physically’ in front of, recording the constant dialogue among the subconscious and the world. New Geography During 70s and over, Ghirri’s various works focus different themes. 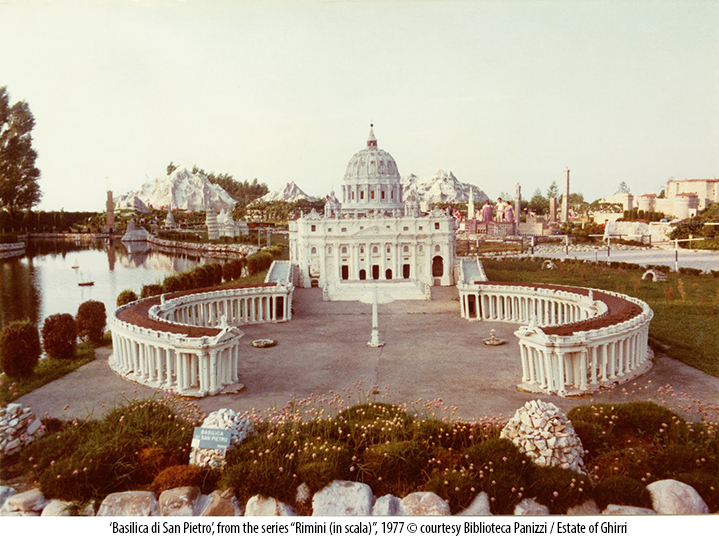 The project ‘In Scala’ (1977-78) shows Rimini’s touristic park ‘Italia in miniatura’ (featuring scale models of the main Italian monuments), getting aware on how people look and perceive landscape/space: now we can see the well famous icons of a nation just at our feet, as in the photo of the Earth from Space. It is specifically and sociologically Italy, but virtually it can be with every nations. 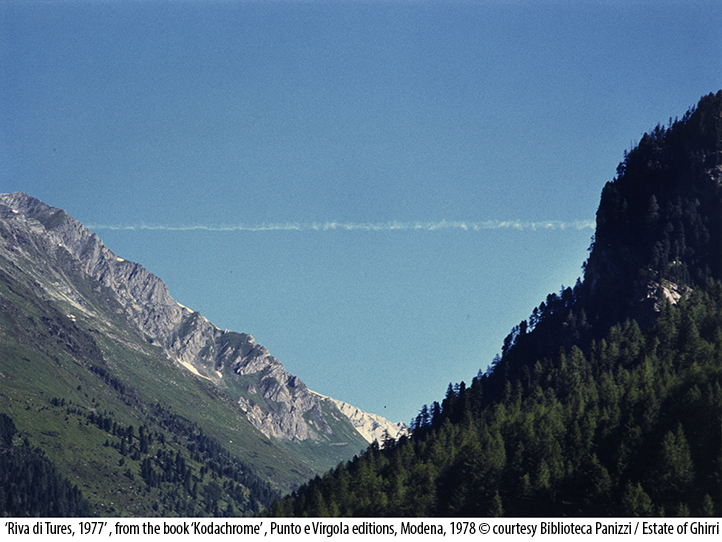 This ‘New Geography’ looks to point the different ‘geographic imaginary’ of today: “All the routes have been marked, the only possible journey now seems to be within the sphere of signs and images, therefore there is the cancellation of the real experience” explains Ghirri  and ‘Week-end’ (1973) pushes the concept of Journey to extreme consequences. The work (artist-publication in few samples) is compiled by photos reproducing cuts and details of different maps in an Atlas book, enlarged until the photo shows real size page details. Photography visually can evoke instead showing, translating act of ‘Seeing/Imaging’ with ‘act of Knowing/Living’ an experience, spotting the gap between imagining a place and once who gets really there, cutting a frame of the world, and thinking about what is left off, as Ghirri writes in Kodachrome. 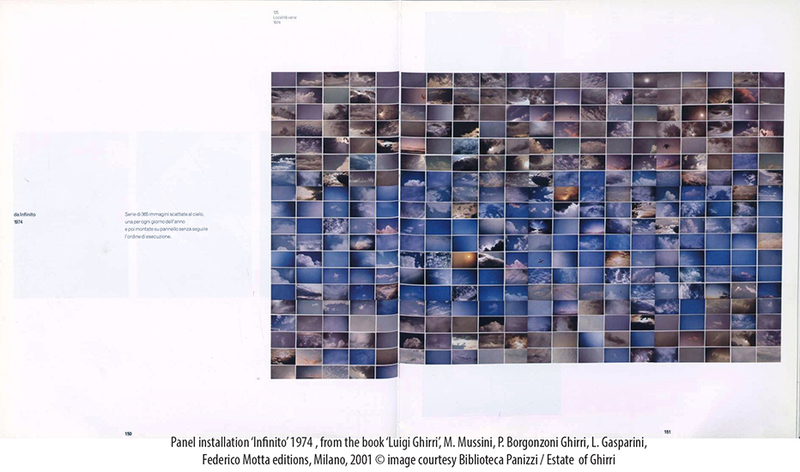 So ‘Infinito’ (1974, English: ‘Infinite‘, ‘with no-end‘), a two panels installation assembling 365 photos of the sky made by Ghirri every day in a year always from different locations, is the try to show the impossible: but the metaphor of sky with its absence of limits, and the use of Time, in a number (365) meaning the entirety of a solar year, gives to us an idea to feel it. Photography is the meeting point of Reality and Imaginary, by memory, image and imagination. 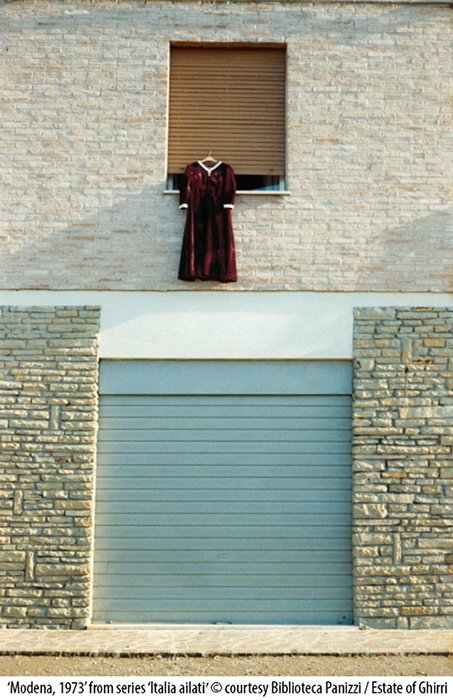 Aesthetic Experience With the increase of fame and respect (in 1975 he becomes Discovery of the year’ for ‘Time-Life’ photography magazine, then he is part of ‘Photography as Art, Art as Photography‘ festival in Kassel, Germany), Luigi Ghirri can dedicate to full-time photographer activity. Various assignments follow in the 80ies, like LP covers for music labels (over classical artists, also for Italian cult punk-band CCCP or songwriter Lucio Dalla), Polaroid International invite to increase the Amsterdam research company collection (1980), commissions by French Minister of Culture photographing Versailles (1985), then in New York for Bulgari, and campaigns for Ferrari and for administrative regions in Italy. 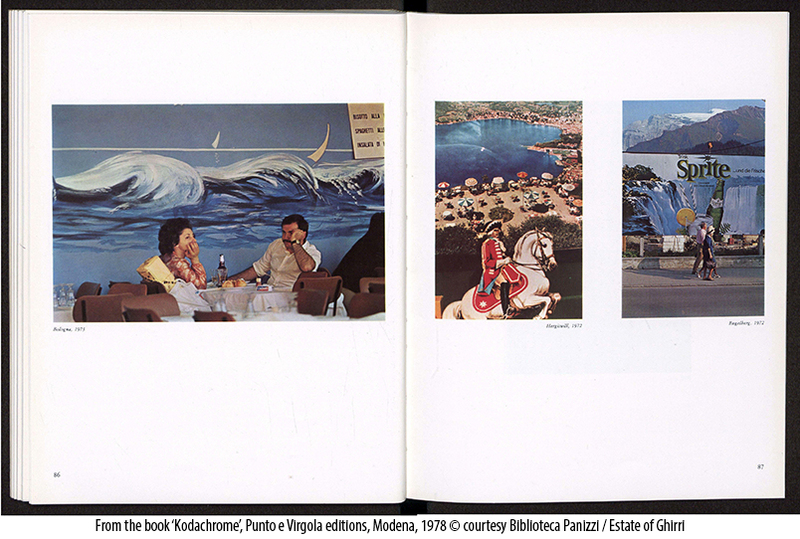 Tirelessly, Ghirri pursues too an activity of publisher, critic and curators, opening in 1977 with few friends the small house editions ‘Punto&virgola’ active until 1982: the first birth is Kodakchrome‘s book, which follows a handful of Western photographers books and essays on Photography. Also personal projects feel this literally opening of the horizon. The still closed entrances in photos of buildings/stores doors at end of 70s (recalling the deep influence of Eugene Atget) open to images of ‘soglie‘, ‘inquadrature naturali‘ (‘gateways’, ‘natural frames’), like the beach horizon with a wood rectangular white frame of an empty (kind of ‘soccer door’) advertising structure at center in ‘Marina di Ravenna, 1986’, from the book ‘Il profilo delle Nuvole’ [The Clouds profile], Milano, Feltrinelli ed., 1989. 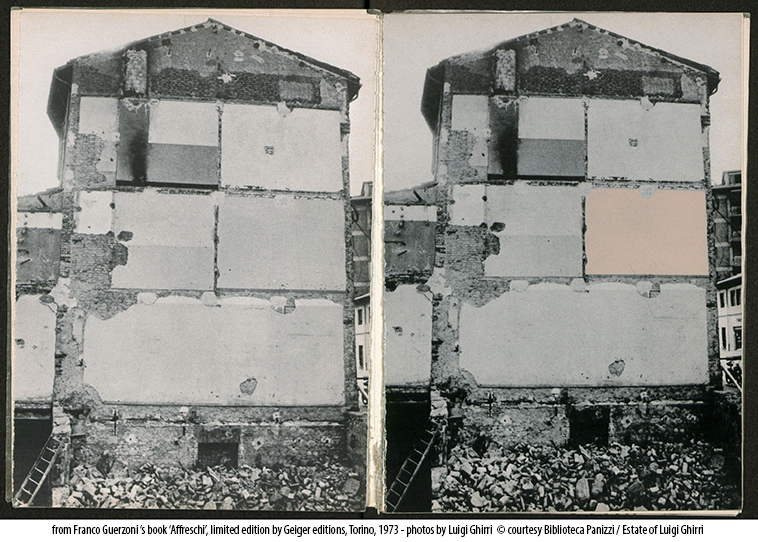 Ghirri seems having metabolized the past ‘cancellation of the real experience’. 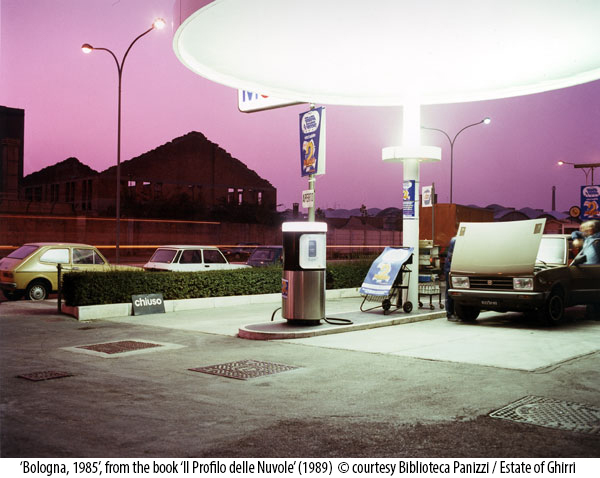 It is the return to a more terrestrial conception of travel, on the road, like in ‘Paesaggio italiano’ (‘Italian landscape‘, book with photos from projects and commissions among 1980-1989), Milano, Electa ed., 1989: horizons and cuts of churches, piazzas, interiors, gas-stations, bars in the outskirt and over, these visions are filled by a strong sense of the space, of its visual emotions, and the sensations evoked. “Melancholy is the road sign for an effaced geography, it is the feeling of distance that separates us from a potential simple world” says Ghirri . 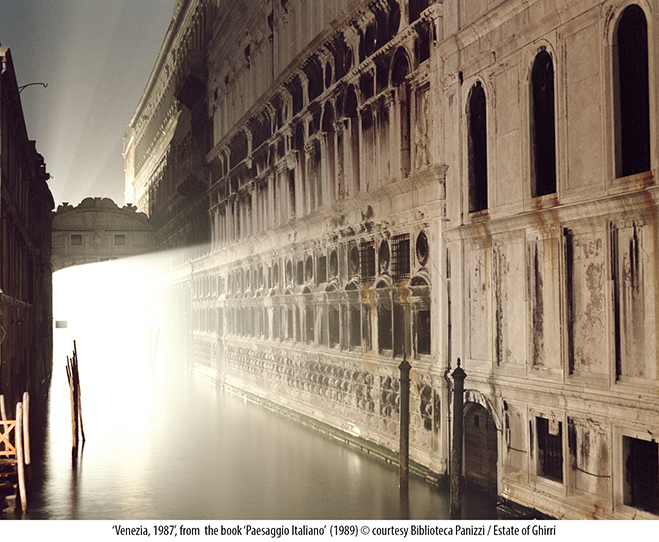 But also mystery and loneliness, or wonder, are intertwined with nature and humans landscapes, in a beautiful but anti-classic view which regenerate the iconographic Italian panoramas, like the sudden powerful light shaping one water-street of Venice (Venezia, 1987), much closer to Caravaggio painting then traditional Canaletto works. Photographing is like an aesthetic experience, where the exploration of the space is fully guided by a feeling of atmosphere and suggestion. ‘Aesthetic’ again goes back to the roots of its original ancient Greek meaning: αἰσθητικός (aisthetikos, “esthetic, sensitive, sentient”), which in turn was derived from αἰσθάνομαι (aisthanomai, “I perceive, feel, sense”). 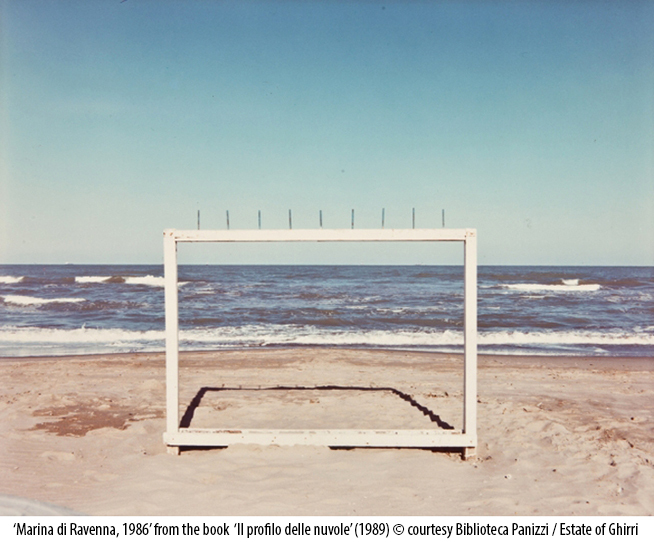 Last Roll Among 1989 and 1990, on the peak of his success, Luigi Ghirri experiences also to teach Photography classes about his personal practice at University of Reggio Emilia (published then in his posthumous book ‘Lezioni di Fotografia’, Quodilibet, 2010). 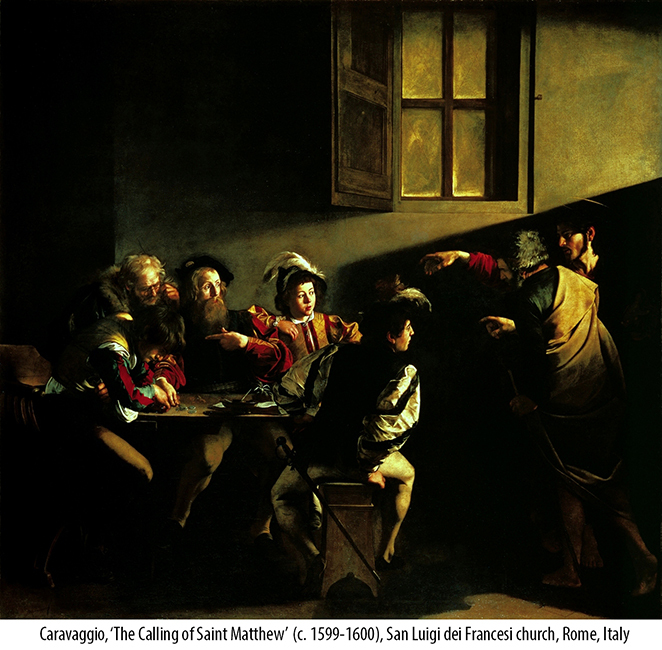 Two years later, unexpectedly, he died at his home in Reggio Emilia for heart attack. Last series taken on roll by him was depicting the decaying houses of the fertile land of Po Valley, in the northern Italian province where Ghirri had lived and worked most of his life. 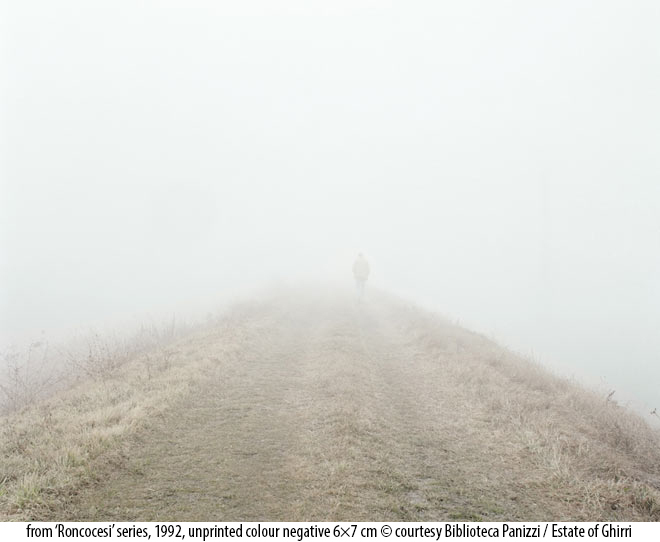 Now the Public Library of Reggio Emilia town in Italy, the Biblioteca Panizzi, houses his archive of negatives, slides and publications, following the will of himself expressed in 1990. This vast visual ‘Imaginary Geography’ is today the boundless legacy of him. Born in Rome, Italy. Graduated in Journalism (2004), he approached Photography by passion for traveling, focusing on personal projects and commissions in Documentary field. Since 2006 he participates in exhibitions (i.e. 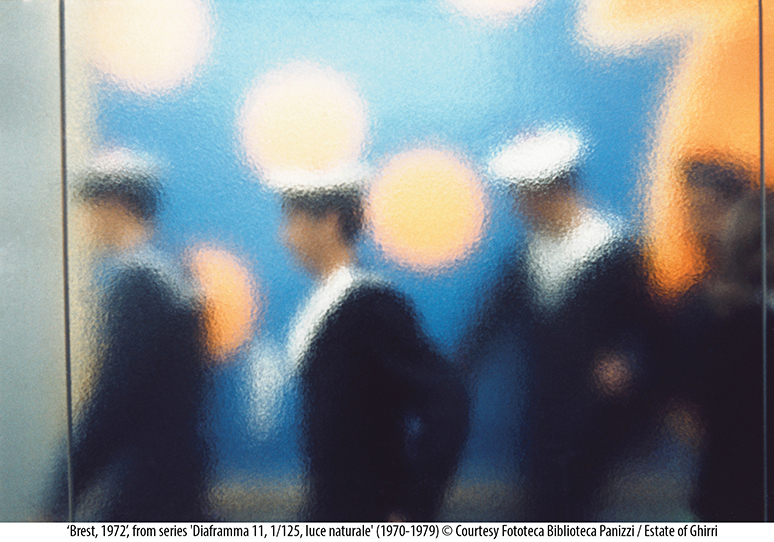 'Brooklyn Artillery Art Fair', New York, 2009; 'Bursa Photo Fest', Turkey, 2011; 'Human Flows', U.K., 2013; 'The Russian Moment - 20 world's leading photographers expedition in Russia, July 2013', Saint Petersburg, 2013). Docked by chance in New York City for a while, he had opportunity to be Teaching Assistent in International Center of Photography (2009-2010) and from 2013 he is a contributor of the ICP Library Blog. 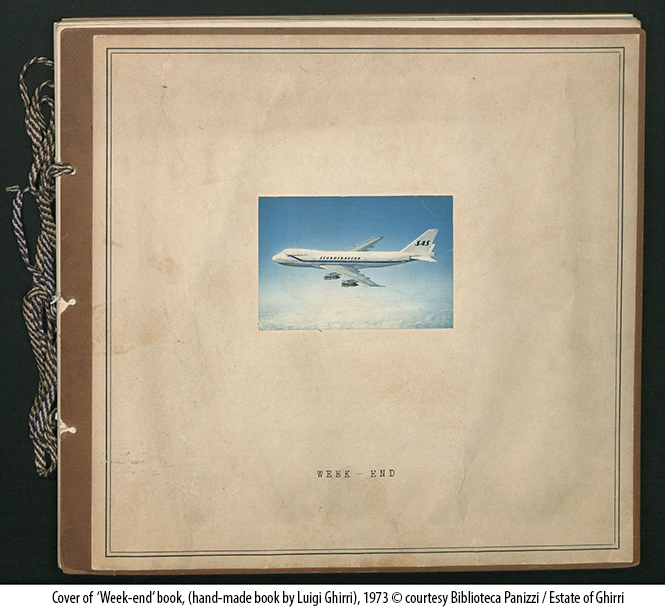 This entry was posted in artists' books, Exhibitions, International, Visual Research and tagged Biblioteca Panizzi, Casa Ghirri, CCCP, color photography, Conceptualism, Emiliano Cavicchi, Epica Etica Etnica Pathos, François Halard, Geography, Kodachrome, Luigi Ghirri, MACK Books, Matthew Marks Gallery, William Eggleston. Bookmark the permalink. искал в гугле интернет магазин lg, нашел ваш блог Luigi Ghirri, the Absolute Fascination of the Image | International …, спасибо! Danke für euren hilfreichen Artikel. Ich lese schon seit Längerem auf eurem interessanten Blog. Und gerade musste mich mal zu Wort melden und “Danke” sagen.